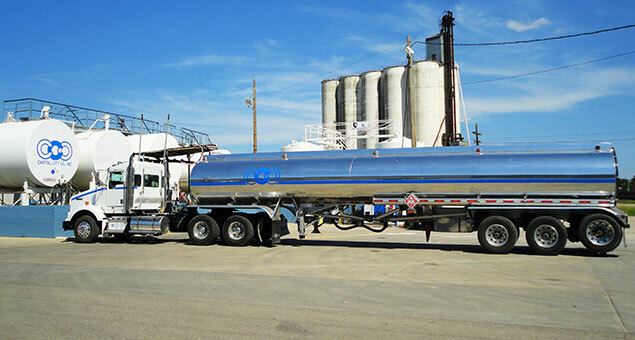 Delivering quality fuel when it’s needed, how it’s preferred, and always on time. There’s a level of comfort seeing the same smiling face with every delivery. Most of our fuel deliveries are based on keep-full routes to ensure you have product when you need it. But we are also happy to fill orders on a call-in basis, as the need arises. Our delivery drivers each have a designated route in order to build a consistent relationship; allowing us to better understand your individual delivery preferences, which also reduces mistakes and missed deliveries. Ensuring your operation doesn’t run out of fuel when you least expect it. We offer unmatched customer service at a competitive price. And our modern, well-maintained vehicles have electronic metering systems to assure the customer that gallons delivered match gallons invoiced. Our fleet of transports can deliver up to 8,000 gallons of refined fuels or propane to your business anywhere in Northeast Kansas. Our experienced drivers and dispatchers are committed to delivering the correct product when you want it. And all of our tractors, trailers, hoses, and fittings are maintained to the highest standards in the industry. Alternative fuels with Ethanol blended gas and varying percentages of Bio Diesel (from B2 up to B100) are also available for delivery. Take a look at descriptions of all the fuel we offer by clicking here. Ready to have your fuel delivered by a reliable and familiar face?